Meet Kasmira! She began her journey at KCRW the way many do, with humble beginnings submitting an application and waiting to hear. But Kasmira didn’t want to wait, so she began helping out at our many events. She then signed up for the Summer Marketing Internship where she was a star. 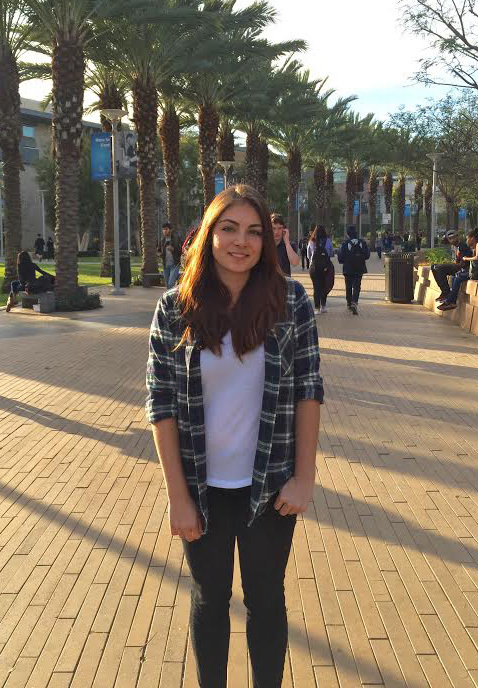 Then when that wasn’t enough KCRW for her, she applied for the SMC Internship, in which she also stood out. And when that came to a close and she wanted to continue her KCRW journey, she started interning in the news room, where she is now learning all she can about news production! That sort of deep commitment and tenacity is a shining example of Kasmira’s greatness and we are so happy to have her here with us! I grew up in Ventura, CA. I am an only child, but you wouldn’t guess that… at least not right away. I don’t currently have any pets, but I am very interested in getting a frog or toad at the moment. This is a strange question since I have been watching Lost since the beginning of the year and find myself asking that question all the time. I would want an endless supply of water, a book from every genre, cheese for sure, blankets, and a companion. Currently I work in the restaurant business but I’m also working on a few audio/podcast projects on the side. I am trying to break into the radio and audio world. Stay tuned! Any occupation? Honestly, exactly what I am trying to do right now! Which is to become a producer at a station just like KCRW. No hints here. I first discovered the station when I would drive really late to work out in Santa Monica. I loved the MBE music. It reminded me of KEXP in Seattle. And then I started listening on my commutes home and just got really hooked on various programs. Well, I decided to pursue radio instead of working in a soul killing office. So I filled out the volunteer form and crossed my fingers. And then I called Danny Sway way too eagerly after only a week of waiting for a response. He turned me onto the volunteer email list and before I knew it I was a summer media intern! Currently I volunteer with All Things Considered, which is my third volunteer position at the station! I have been involved since November and I absolutely love it. Wow! That is a tough one. I tend to get mic fright but I could squeak something out! It’s so lame but I would love to say the very basic, “I’m Kasmira Hall and you are listening to KCRW.” I mean if you need someone to do voicers… I’m available! heh. My favorite moment… I have a few! But I would say my top experience was volunteering at the Hammer Museum Soul night for the KCRW Summer Nights concerts. The suffers, Jungle Fire, Garth Trinidad… they were all killing it. Lately I have been listening to ‘Ocean Eyes’ by Billie Eilish, ‘Dragonfly’ by Malinchak, and ‘C.R.E.A.M.’ from Wu-Tang Clan. I just read a really great book I couldn’t put down called ‘Widow Basquiat’. I haven’t been that engrossed in a book for a long time. It was great. Outside the station I love to travel. Anywhere and everywhere. And when I can’t do that, hiking and eating at delicious eateries around the city suffice just fine. KCRW means so many different things for me. Not as a volunteer, but as a listener, I find the station to be multifaceted and very considerate of a variety of listeners. It’s such a unique format for public radio to cover news, new music, literature, food around the city,etc (this is only the second major city I’ve lived in so I could be wrong). There really is something for everyone and I feel it really joins LA together as a community. Personally, KCRW is very special to me and I have so much respect and gratitude for everyone here. I have been exposed to so many different facets of the station and they have truly allowed me to jump in and and learn more whenever I am interested. It feels like a family who wants you to succeed and gets excited when you are excited about things. I have learned an innumerable amount of skills that will really help me in the future and I am forever grateful to the volunteer program and all the amazing people behind the scenes. You guys truly are the best! So thank you. Kas, as someone who’s had a couple of toads, they are very cute but they croak all night and you can’t really pet them so I don’t recommend them as pets… unless you’re mostly nocturnal as well. I hear good things about rabbits as pets. Oh yeah, and thanks for everything you do for KCRW – it’s great to have you here!